For the first time, DWP headquarters will be installed on the east side of the city at The Redd , 831 SE Salmon St., a new Ecotrust development. The doors are open to the public April 24-28 from 11am to 7pm and will highlight an interactive exhibition on the Green Loop, the proposed six-mile pedestrian and bike promenade linking the city’s east and west sides. 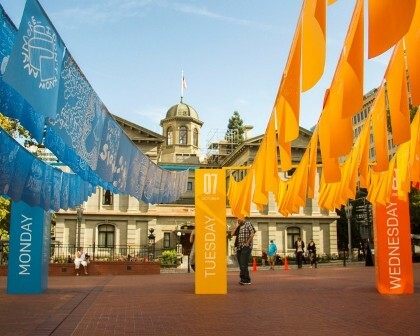 Developed by Untitled Studio, winners of last year’s LoopPDX competition, the exhibit invites the community to come together to learn, react, discuss and further envision the project’s potential. Headquarters also will act as the festival’s information hub and living room—creating a neighborhood gathering space for participants to plan their itineraries and share their experiences. Content from DWP is released monthly via The Journal. Each month, a video of one of the talks will be released with a companion piece of content. Each installment is created to spark thinking and dialogue within the design community. DWP is a non-profit organization that celebrates and promotes design as the city’s most promising cultural economic resource. The mission of the organization is to increase awareness about design: what it is and what it can do for business, education and the economy in Portland with the aim of shaping the evolving state of design in the city.